Marc Marquez made history by becoming the youngest ever MotoGP World Champion in Valencia on Sunday, completing the season-ending race third to become the first rookie premier class title winner for 35 years. The Repsol Honda Team rider, who started from pole position, shared the podium with team-mate Dani Pedrosa as race victory went to outgoing title winner Jorge Lorenzo of Yamaha Factory Racing. L-R Dani Pedrosa, Marc Marquez and Jorge Lorenzo. Marc Marquez: “It was a really long race, maybe the longest of my career! At the start I was very nervous, I know I said I wasn’t but if I’m honest I really was. Jorge had a very good start, as usual, and I wasn’t sure which tactic to take. I followed Jorge and Dani and began to settle into the race. Then towards the end, I decided not to push as I knew my position was secure and safe to take the Championship. Having already made himself the youngest premier class race winner and pole-sitter as well as registering numerous other records, Marquez now becomes the youngest ever World Champion and takes the mantle away from Freddie Spencer. At the same time, the 20-year-old from Cervera, Catalunya becomes the first rookie World Champion for 35 years, following in the footsteps of Kenny Roberts from 1978. 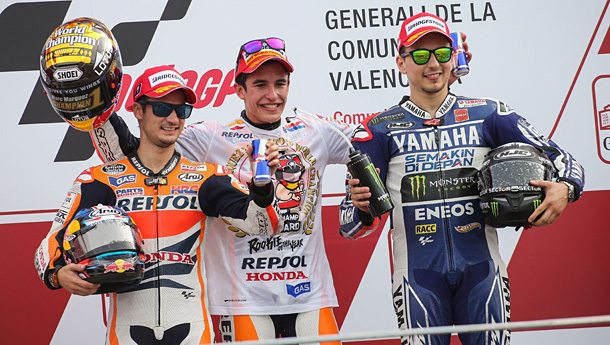 Race winner Jorge Lorenzo with Dani Pedrosa (26) and Marc Marquez (93). Lorenzo made his plan clear over the opening laps. 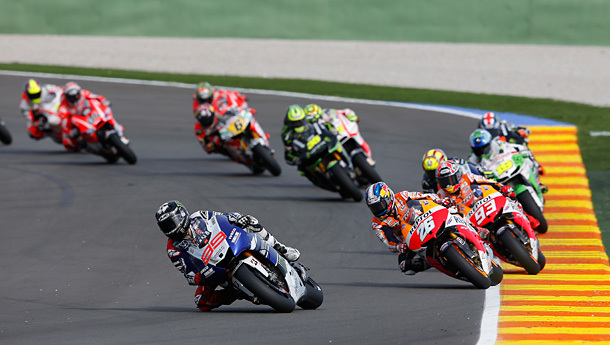 Having shot through into the lead, the title winner of 2010 and 2012 attempted to slow the pace as last year’s victor Pedrosa ran second from Marquez, Alvaro Bautista (GO&FUN Honda Gresini) and Valentino Rossi (Yamaha Factory Racing). 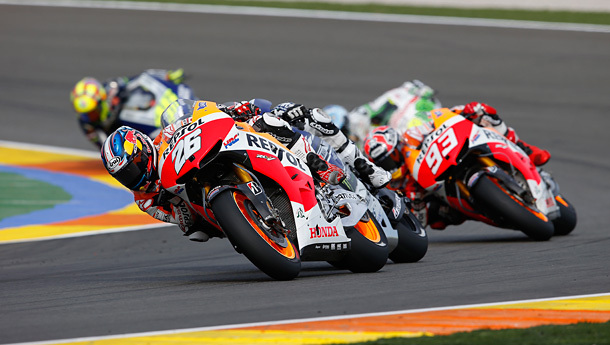 Dani Pedrosa momentarily took the lead before being clipped from behind by Lorenzo. With Pedrosa avoiding a series of incidents, the tipping point came on Lap 10 as Pedrosa overhauled Lorenzo but was instantly pushed wide at Doohan corner, leaving Marquez in the lead. The overtaking maneuver is being reviewed by Race Direction and a decision will be made post-race. Lorenzo retook the top spot just a lap later, while Bautista pressured Rossi before dropping to fifth and the recovering Pedrosa rose to third before being waved through by Marquez on the 26th tour. By this point, knowing Marquez would still become World Champion, Lorenzo put the power down to win for the eighth time this year (two more victories than Marquez) by almost four seconds. Pedrosa collected his 13th rostrum of the season, with Marquez sealing the world title in a comfortable third. 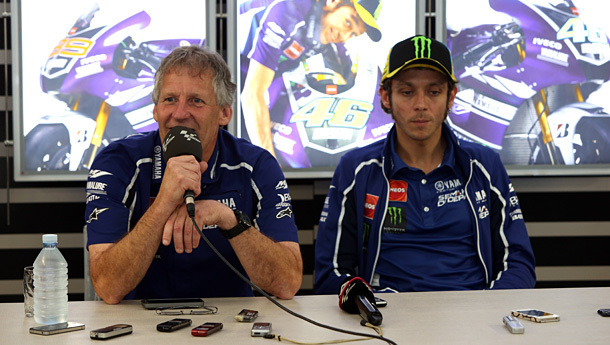 Jeremy Burgess and Valentino Rossi. Elsewhere, Rossi signed off his partnership with long-time Crew Chief Jeremy Burgess in fourth place, ahead of Bautista as LCR Honda MotoGP’s Stefan Bradl finished sixth from Monster Yamaha Tech3’s Bradley Smith and Ducati Team trio Nicky Hayden (in his last race for the Italian marque), Andrea Dovizioso and Michele Pirro. Aleix Espargaro finished 11th in the last event to feature the CRT label, while Cal Crutchlow crashed out of his final Grand Prix with the Tech3 outfit. 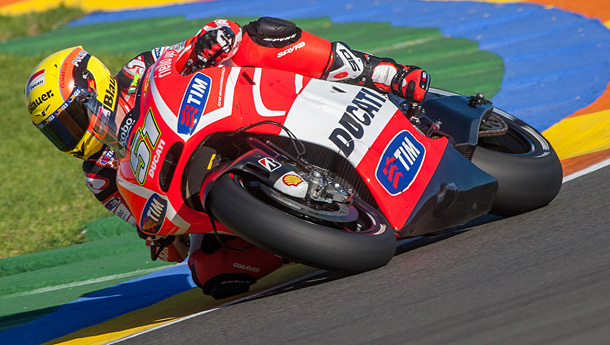 A top 10 finish for Ducati’s Michele Pirro. Six riders failed to make the finish: Damian Cudlin (PBM), Lukas Pesek (Came IodaRacing Project), Yonny Hernandez (Ignite Pramac Racing), Randy de Puniet (Power Electronics Aspar), Andrea Iannone (Energy T.I. Pramac Racing) and the aforementioned Crutchlow, while Remus Racing Team wildcard Martin Bauer successfully completed the distance on his second MotoGP appearance. The 2014 campaign will kick-off in Qatar on Sunday 23 March, with Marc Marquez heading to the Losail International Circuit as the 26th premier class World Champion.